In the many places I have lived, I can think of one constant thing that has made each place so memorable. That would be my dear friend, the sun. I can no longer remember the days of sunny Seville because since I have arrived in this oh so sunny in 2009 city, the 2010 version of Seville has decided to be a little less sunny. So, what do I do? I look at all the pictures of the sunny places I have been and lived. This has given me small portion of hope (albeit without the vitamin D) that there is sun somewhere in the world. That and my mom’s care packages. Oh yes… I may not be in college anymore, but travelling and living abroad you learn to live without a lot of things, but some things I just haven’t quite yet departed from. And I’ve been trying to bring the sun with me for years… sometimes it comes. sometimes it doesn’t. Just wanted to let you know some of my thoughts before I say good-bye. You were very kind to me and I want to first thank-you for this. Then, I would like to say how impressed I was with your vast landscapes. I saw your cities, your beaches, and your mountains. They were all more beautiful than the last. You are so very fortunate to be so rich in nature, culture, and history. Your food is worth mentioning too, as it was nothing less than exquisite. Thank you for not always thinking you had to put mean in everything, very considerate indeed. Thank you for also having a European feel. I say this because you provided a nice transition from the culture I know to the culture I knew little about. Now I am writing from your neighbor, Syria, and I must admit you were a nice start to my trip. Again, your subtle transition from European culture to Middle East culture really helped me escape sudden culture shock. Thanks for being there for me. 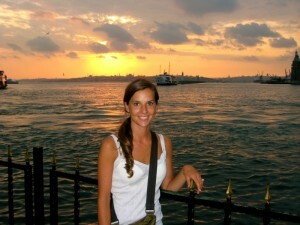 However… Turkey, why must you charge me for a visa? This is one of my only complaints. I’m in the EU club, I thought you wanted to be in too? I suggest you don’t charge me the next time I come. Well, speaking of the club, I sure hope you get in in 2012. It would not only ensure more stability in your oh so lovely country, but it would also high-lite your strengths and character to the many people who cant experience it first hand. Well, thanks again for your invite to return soon, I shall. 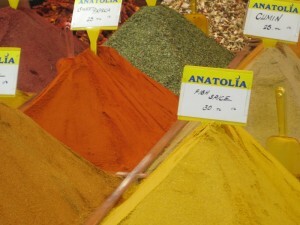 ps- your top 5 include: the Archeological Museum, Blue Mosque, Spice Bazaar, your beaches, and food food food food! how: by bus, 9 hours, Suha Bus Co. and ghe-tto bus co. I don’t remember much after changing buses in Kayseri (1hr. after we boarded the bus in Goreme), it was probably better that way. However, I did wake-up with butterflies in my stomach. Today was the day we were crossing into Syria and I was a bit nervous about obtaining my visa at the border, as many people including my embassy highly recommended getting the visa before the border because Syrian officials can turn you away without a reason. Americans without a visa can expect to wait an average of 8 hours for their visa. I am traveling on my European passport so I hoped it would be a bit easier. G and I arrived in Antakya and were bombarded with people asking us to take us across the border. An hour later we boarded a ghe-ttto bus with 5 Turkish people and us to the border. The border crossing went something like this: wait 10 minutes at Turkish border. get out of bus. Turkish official, look, observe, stamp passport. get back on bus. 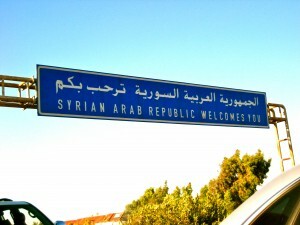 drive 2 km to the Syrian border. 5 Turkish people on the bus look at us in disgust as they know we don’t have a visa and they will have to wait. get off bus. go in to Syrian border building. after much confusion, pay 52 dollars for a visa. get hustled back into a weird office in the back of the building. give our passports to someone and he puts them on his desk. he continues to drink tea. we continue to sit there. he continues to drink his tea. we don’t see our bus anymore. he drinks tea. he disappears with his tea and our passports. we laugh/cry. he returns. drinks tea. gives our passports back. calls G to his desk. says Ronaldinho!!!. welcome to Syria. we go find our bus. get stopped by Syrian official. he asks where we are from. G says Brazil. official continues to name the whole brazilian football squad. he smiles. we smile. he says welcome. we are successful. how: night bus, 9 hours, Metro Bus Co.
5:30 am was approaching and I reluctantly opened my eyes (after a 9 hour bus ride), but was surprised to find myself surrounded by the ‘fairy chimneys’ of Cappadochia! It’s exactly like the pictures lead you to believe and a really mystical place… like a fairytale land. Only staying a day we wanted to find a hostel where we could store our stuff, Kookaburra Pension charged us about 5 lira to keep our bags and take a shower, a perfect deal. Cappadochia, or the mountains and cliffs, were formed when Ericyes Daği erupted. Then, when the Byzantines came they carved churches and cities out of these erupting mountains, called fairy chimneys. There are also hundreds of kilometers of underground cities that were used and built by Christians as a place of hiding to escape from the persecution of the Roman soldiers. G and I hiked (above ground) for the rest of the day and then boarded our bus to Antakya (Hatay) at 20:30… exhausted. Some r&r time was greatly needed after the hustle and bustle of Istanbul. 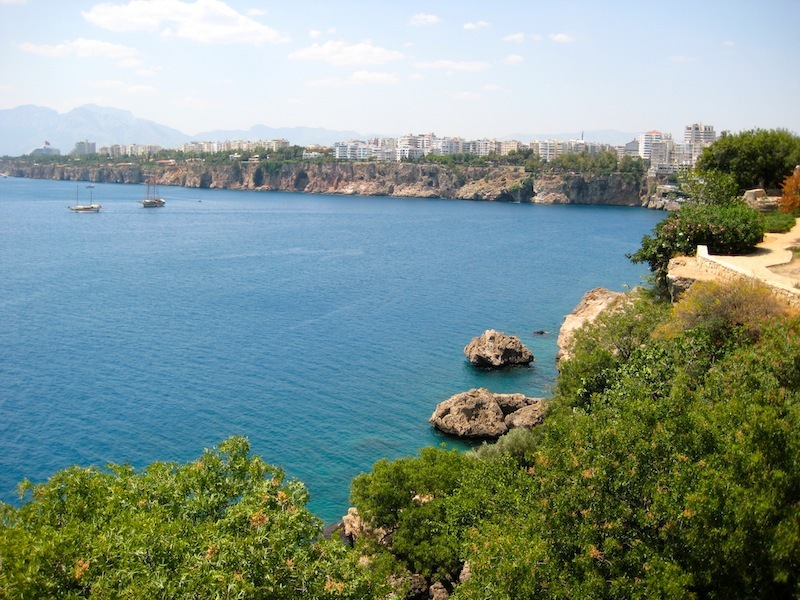 Antalya is situated in the southwestern part of Turkey on the crystal-blue waters of the Mediterranean. G and I arrived at 2am and went straight to our Cs host who was waiting for us (thank you Fevy!). Not too much to write about this city because we went to the beach for 3 days. 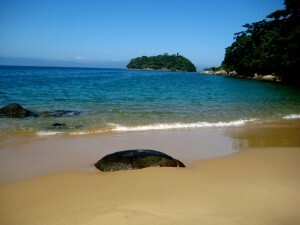 The water is fantastically clear, clean, and warm. Antalya is a beach city and although it has about a population of 1.5 million it seems like a small town. On thing worth noting is that it has been a great challenge to find English speaking people around Turkey. 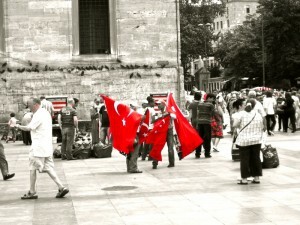 This surprises me and I thought that out of all the countries I would visit, I would have the least trouble in Turkey. Well, with some hand gestures, bad directions, and horrible Turkish it has been manageable, but challenging. 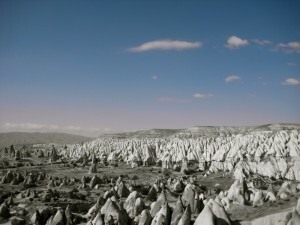 We did make a little change in our plans, and decided to head to Cappadocia, the land of the fairy chimneys! 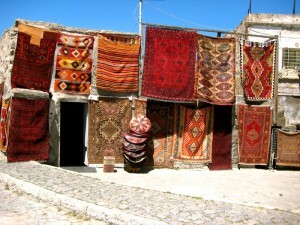 We leave tonight and are headed on a night bus, arriving in Göreme tomorrow morning. I’m off, off and away. 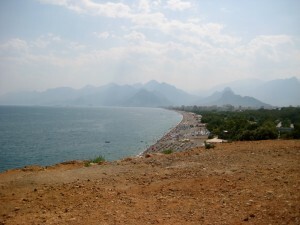 While planning my trip to Turkey it was hard to imagine not going also to its neighbor…Syria. But how, you might say, how can I go to Syria without going to Jordan, so I decided to go to Jordan too. And since Israel is so near, why not go there too! And well… then there are the few little pyramids just a little bit south… so… why the heck not. So, it begins my trip in the middle east. A lot of people are a bit weary of my trip, they are right to be and I do not take their words lightly. Safety, finances, and health are the top three concerns I have while doing this trip, but I pray and ask for your prayers that these things will be looked after. Some of you may know that G and I are couchsurfing, this is something completely new for us. CSing is literally what it sounds like; you surf (or rather, sleep) on couches. This is run and organized by an online network called couchsurfing.org. This has allowed me to save a considerable amount of money on accommodation. Not only this, but we get to stay with locals, learn more about their cultures and countries and try to avoid all of the tourist traps. The trip will go something like this… start in Istanbul then travel south to Antalya and across to Antakya which borders Syria. 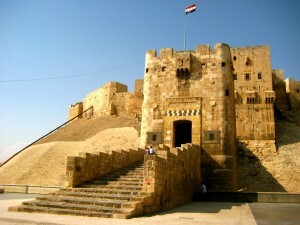 From there I will travel to Aleppo in the north and work my way down Syria stopping in Hama, Palmyra, and finally Damascus. After Syria, I head to Jordan stopping in Amman, Petra, Wadi Rum, and Aqaba. In the middle of Jordan I will make a pit stop to Israel and visit Jerusalem, Bethlehem, the Dead Sea, and Tel Aviv. Finally, I will reach Egypt and see Cairo and possibly Luxor. They are flexible plans and open for change…this is the best part.